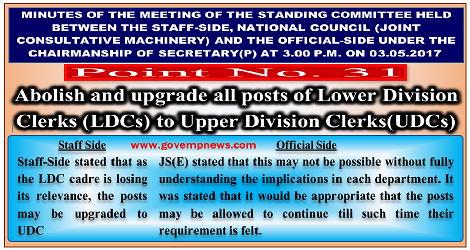 Staff-Side stated that as the LDC cadre is losing its relevance, the posts may be upgraded to UDC. JS(E) stated that this may not be possible without fully understanding the implications in each department. It was stated that it would be appropriate that the posts may be allowed to continue till such time their requirement is felt. Reacting to the comment made by the Official-Side, the Staff-Side pointed out that prima facie, on introduction of computerized functioning in almost all departments, the functions assigned to LDCs have become redundant. What is required is to get the report from each department and take a conscious decision, as LDC is a common category.